Developer: TT Fusion. Released: June 2015. Other versions: X360; PC; WIIU; PS4; PS3; VITA; 3DS. 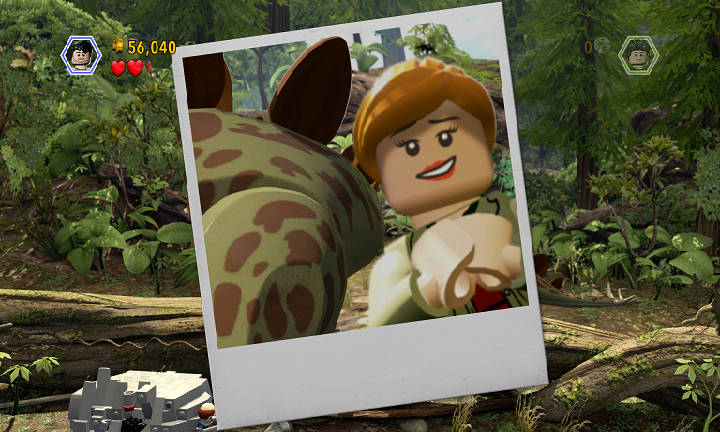 Though no one anticipated the success Jurassic World would enjoy in theatres, it was easy to anticipate a LEGO-fied version of the films coming out. With several LEGO games arriving in 2015 alone – including a Skylanders-style ‘toys to life’ game – LJP could have easily got lost in the shuffle. 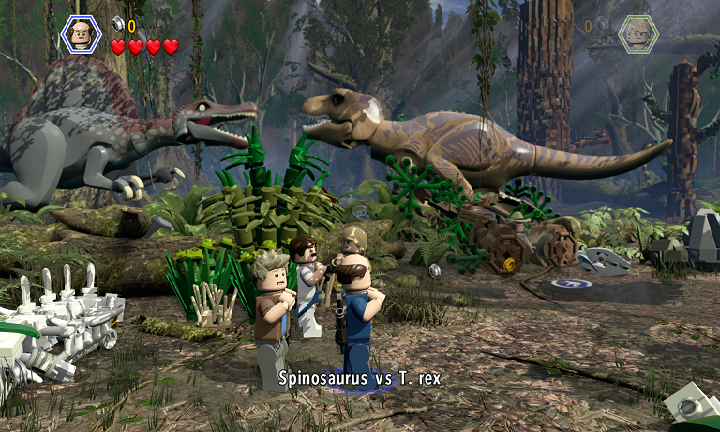 It does have some pretty unusual quirks, such as being able to play as many of the film’s dinosaurs and some solid humour the series is known for. But a nauseating overworld and feeling of familiarity means that it lacks a lot of new thrills for older gamers, though younger players should eat it up. Without sounding too cynical, bearing in mind who the game is targeted at, if you’ve played any LEGO game in the past few months, you’ll quickly become familiar with LJP. Divided into twenty levels, with each film receiving five a piece, and outside of missions you can explore four overworlds based around each film. Levels themselves put more of a focus on puzzle-solving, with light platforming mixed inbetween. There’s a roster of 100 characters to use, each coming with their own abilities. 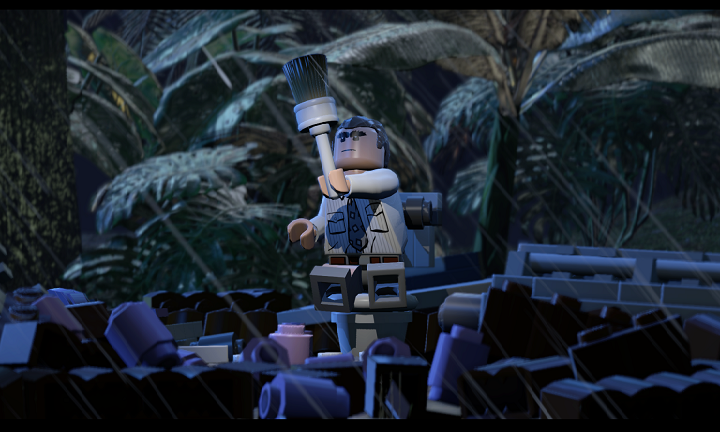 Dr. Grant, for example, can dig up specific sections of dirt and cut through thicker vines, while Nick Van Owen from The Lost World can pry open doors, take photographs and break padlocks. There’s some giddy appeal, though, in also controlling around twenty species of dinosaurs, ranging from the classic T-Rex to the newer film’s Indominous Rex. Though the dinos are awesome, the roster lacks a lot of distinct characters, mostly compiled of grunts and other less notable characters. Levels are often bite-sized versions of the films events. Each level lasts around twenty minutes, as you utilise specific characters to progress through puzzles, combat encounters and platforming. 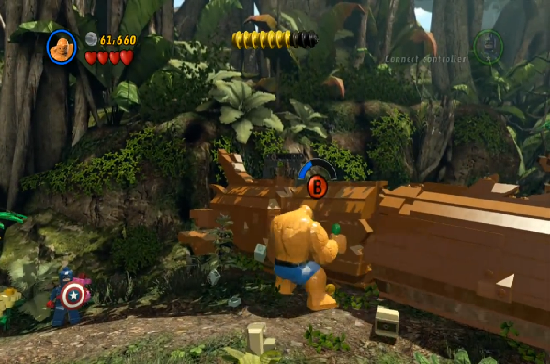 What you will notice, as in other LEGO games, is that many parts of each level are blocked until – after first completing the level – you return to them in free play. Even the overworld is littered with collectibles, a majority of which you won’t be able to touch until you finish the game. Free Play allows you to switch characters on the fly, and this approach essentially encourages two playthroughs to get the coveted 100%. Though really, it will only take you around twenty hours or so to mop up all the collectibles. But, it’s a formula that works, so why change it? The problem is that LJP often feels like a retread, despite its new license. You never really gain a sense of wonder like the films, because these mechanics have been done before for the past years now. The level design also feels unimaginative compared to previous games, as it feels like you move from one simple puzzle to another in dull fashion. Though the cute nods and humour to the series will put a smile on fans of the franchise, it feels like the gameplay isn’t compelling enough to keep you going. Combat remains simple, albeit with frustrating enemies such as the Compsognathus, which despite being introduced in JP3, makes an appearance throughout the game. 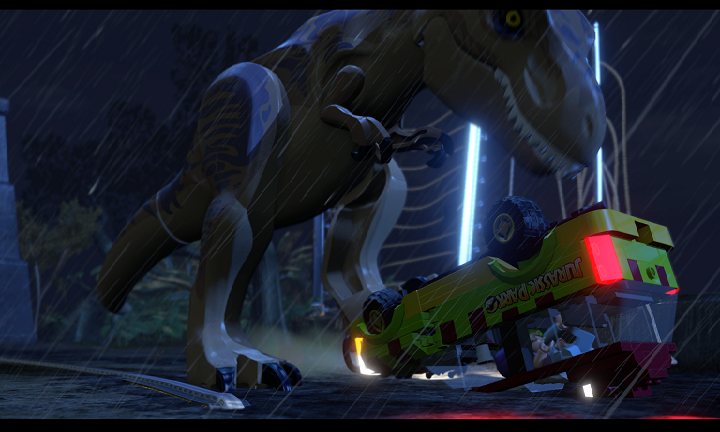 Some attempts at variety come into play, such as chase sequences involving the bigger species of Dino, but overall, the lack of pizzazz in the gameplay leaves you feeling bored at times. The overworlds, unfortunately, are worse. They’re often confusing to navigate, even if you’re just trying to get to the next chapter. You can play Jurassic Park and Jurassic World from the get-go, but for some reason, you cannot access The Lost World or Jurassic Park III until you complete the first film. Warp points can make travelling easier, but the basic map often leaves you scratching your head on how to even move to another area. 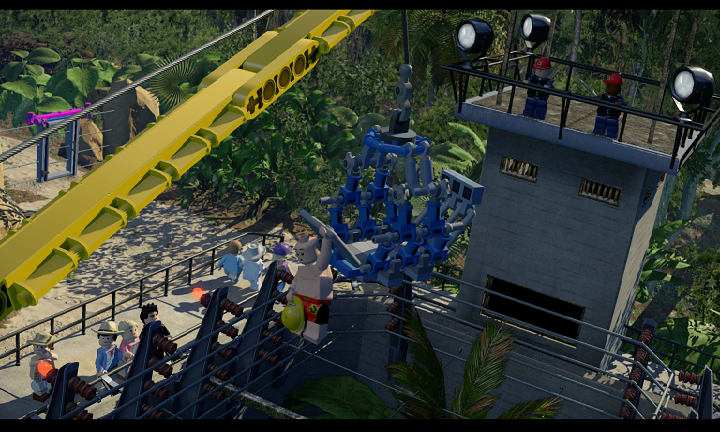 And while collectibles become highlighted on your map after finding Kiosks, it often can leave the map looking crowded. It’s just a mess to navigate, and way harder to explore considering the target demographic. It’s a shame, because these issues dilute some of the more positive elements. As I mentioned, playing as dinosaurs can be awesome, but it takes a majority of the game before you even unlock them. Eventually you can actually create your own custom characters and dinosaurs, allowing you to splice together different powers to other species. The humour is mostly on point too, with some clever silent humour from the dinos themselves and an amusing approach to handling character deaths in the movies. But the audio isn’t always great, particularly in sound mixing. As the developers have spliced voice-clips from the old movies, it’s often notable how scratchy and dated they sound next to the newly recorded stuff. But, there is some appeal in hearing some classic lines of dialogue again. And though never technically staggering, the levels look crisp enough, the animation is fun and the frame rate never chops. 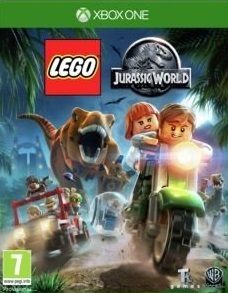 In the end, LEGO Jurassic World somewhat resembles the fossilised creatures it lets you control. Never really taking much risk with the formula, and even adding in some frustrating new problems, it still has a modest amount of appeal through its tongue-in-cheek humour, silly nods to the older films and solid, if uninspired, design. In the end, kids will still probably eat it up, but any discerning gamer will notice that the formula that was once fresh for TT Games is starting to lose it’s lustre.